Your cat deserves the best – and you deserve a clean, sanitary living environment. Litter boxes can be stinky and tough to clean. 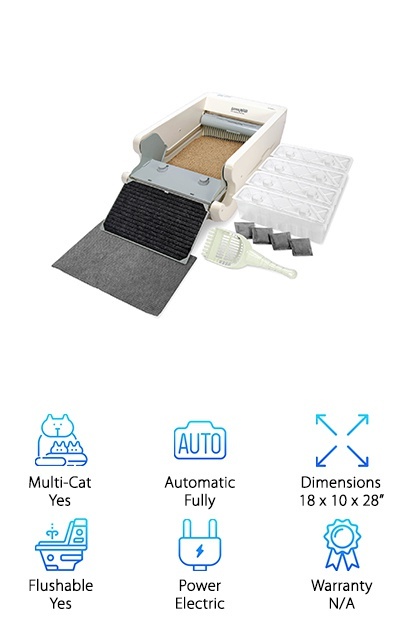 Have you ever considered an automatic litter box for multiple cats? We researched a variety of new and bestselling products to help you find the best automatic litter boxes. The result is the top ten best automatic litter box reviews below. Now: Before we get started, here’s what you need to know as you prowl around for a good deal. 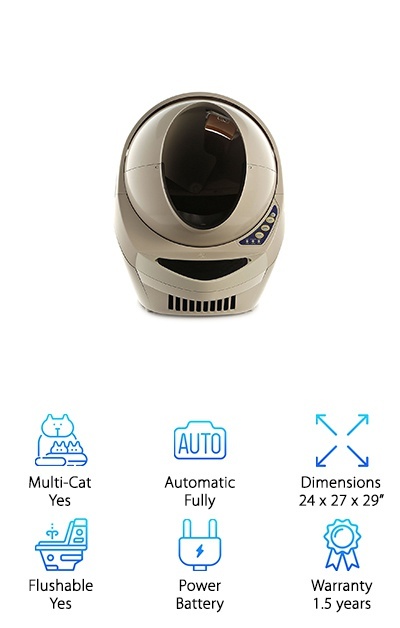 Multi-Cat: While there are some models of automatic litter boxes out there that cater to a solo kitty, many of our favorite items handle the load of more than one cat with ease. They are spacious, efficient and work with multiples. Automatic: The products we picked are all either semi-automatic or fully automatic, so we created this category for easy reference. Whether you’re looking for one or the other, you’ll find the best available on the market today. Check it out! Dimensions: Our dimension markers include height, length, and width. Armed with that information, you can easily gauge if you have enough space for the litter box you like inside your home. We have some real winners that could be a perfect fit. Flushable: Automatic litter boxes move the waste aside, hide it or store it. Then there’s the part where you need to get rid of the waste – we’ll let you know if the waste can be disposed of easily using a toilet. Power: Some of our favorites on this best auto cat litter box list are powered using batteries. Others can be plugged directly into an electrical outlet. 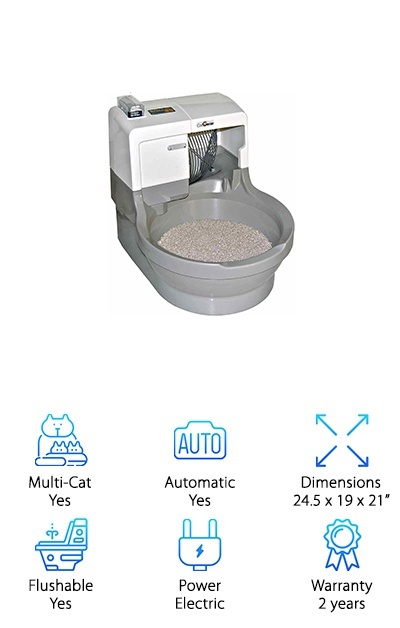 We chose the best automatic litter box for multiple cats with either option. Warranty: You don't need to worry about function on many of these products because they include service and replacement warranties. Check this category for a quick glimpse of what is provided with your purchase. It's easy to tell if it's right for you! 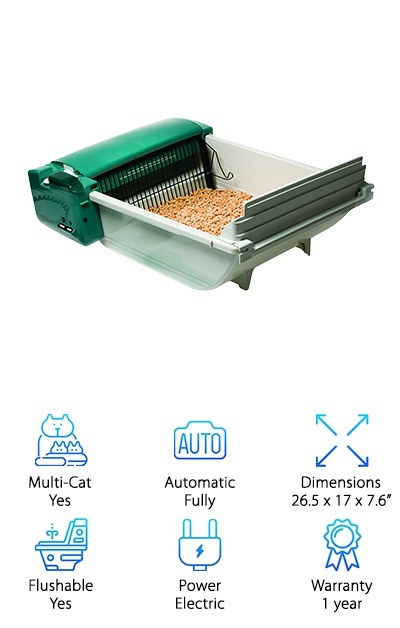 Now that you know how to choose the best automatic litter box, let’s get to the reviews. Here’s the scoop: If you’re in a hurry, no problem! Just look at our top pick and our budget pick. Both are fantastic products, and they’re among the very best litter boxes we found. Right below, you’ll find all runner-ups in our automatic litter box reviews. 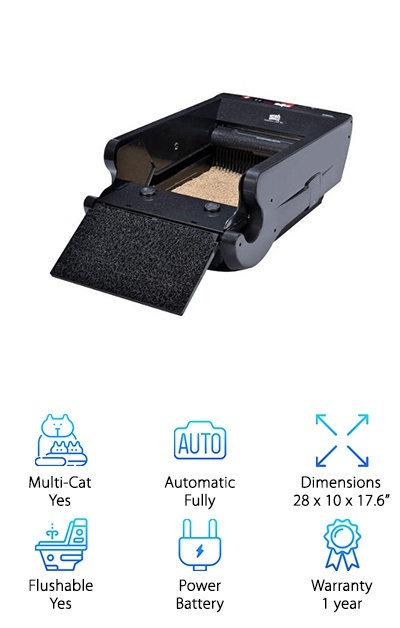 If you’re looking for the best automatic litter box for large cats or for small cats, they’re here! If a litter box could be compared to the Taj Mahal, this would be it. This is the place where fine architecture meets function so that your cat doesn’t knock everyone over with their daily odors. 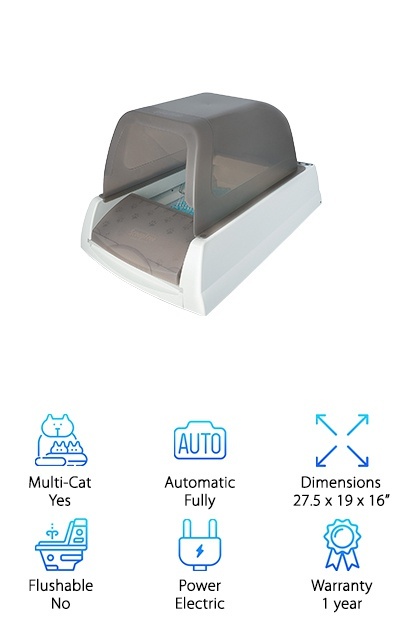 The Litter-Robot III Automatic Litter Box is the result of 15 years of development and feedback from thousands of customers. And it paid off: The Litter-Robot is a self-sufficient little marvel. Measuring 24 by 27 by 29 inches, it sits quietly in your laundry room or the corner of your bedroom and cleans up after your cat for you. Pick the timing of the clean-up cycle, and waste is filtered out and dropped into a carbon-filtered drawer. No special bags are needed, regular kitchen bags will work. The light on the robot will blink when it’s time to take out the trash. The robot is battery run and fully automatic, with a 90-day money-back guarantee and an 18-month warranty. Get this gadget today! The best cat litter box for multiple cats should function quickly, with little effort. What if we told you that you could clean your litter box yourself in under a minute, without even needing electric or battery-powered help? That’s our budget pick, the Omega Paw Self-Cleaning Litter Box. It will last you for as long as your cat is around, because of its deceivingly simple construction. Simply roll the litter box to the right when it is time to clean. The litter is shifted over – and once the box is righted again, it is filtered and only the clumps are left behind. Those clumps can be removed by sliding out a plastic drawer. There is no touching, sorting or extra effort required. 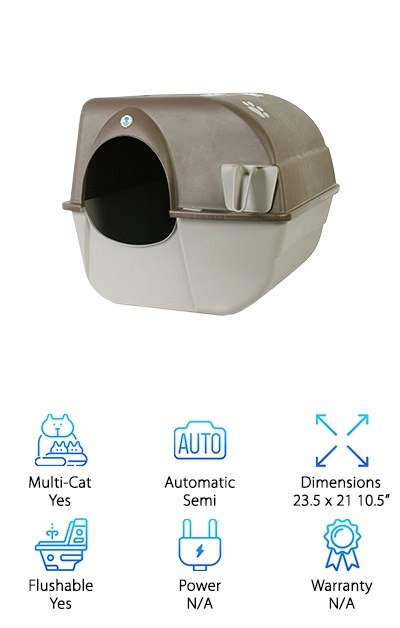 The box opening is 9 by 9 inches, so large cats and families with multiple cats will be able to make good use of this product. If your litter is flushable, the drawer can be carried straight to the toilet! Spots and Whiskers are lovely companions, but one thing they can’t do is clean up after their own waste. You can try and teach them, but in the meantime, you’re probably better off getting a litter box that really works. What about an automatic device that is self-cleaning? Check out the PetSafe ScoopFree Self Cleaning Litter Box. You load it in a minute or two, plug it in, and leave it alone for weeks! It’s that easy. Your cat uses the bathroom, setting off the sensor on the box. The crystal litter absorbs moisture from the waste. Finally, an automatic rake sweeps through the litter and pushes any clumps into the waste trap. Disposable trays can be removed and topped with a lid to be taken straight to the trash. Since it’s powered by electricity, you don’t have to worry about interruptions in “service.” It is also protected by a one-year warranty. Tell Spots and Whiskers they can relax! If you’ve ever wished your cat could use the toilet – now they can. What are we talking about? The CatGenie Self Washing Cat Box. It flushes, just like a toilet! We have plenty of self-cleaning litter boxes here on our list, but this is the only one that will wash itself, too. You just need to place it next to an electrical outlet and a water hookup. Once it’s connected, you fill it with the provided Washable Granules. They perform like litter, but they don’t kick up any of that nasty clay dust. There are three options for running the device – it can be activated by your cats, cleaning whenever they go. It can be preset to run up to 4 times daily, or it can simply be run when you press “Start.” Every time waste is deposited, it is filtered out and flushed. The granules are then washed, heated and dried. Cleaning up could not be easier! We all have plenty to do around the house, and our least favorite task usually involves the litter box. It's an understandable problem since it can create such a stink no matter what you do. That's why it's time to solve the issue once and for all with the Nature's Miracle Self-Cleaning Litter Box. What’s the bottom line? This box makes life easier for you and for your cat – or multiple cats. Set it up and fill it with your cat’s favorite litter, including flushable options. It will automatically rake through and clear the clumps after every use. Carbon filters help catch and contain odors. Antimicrobial protection keeps the yucky bacteria smells down, too. Disposable containers hold the waste until it’s time to throw it away. The box measures 28 by 10 by 17.6 inches, so even large cats will have plenty of room to maneuver. This excellent purchase comes with a 1-year warranty. Let Nature’s Miracle get the job done. Is your cat shy? Does she like to do her business in private? Our reviewers love the PetSafe ScoopFree Self-Cleaning Litter Box, so we were really excited to find a version with a lid. The privacy hood also helps with any mess. Available in two colors, taupe and purple, the PetSafe ScoopFree device still features that magical quick-absorbing crystal litter. Regular clumping litter can spread dust and dirt everywhere. Eliminate air contamination with the provided litter and absorb urine more efficiently. Then you can select from three different options for timing. Whatever you choose, the rake timer is automatically reset when your cat enters the box, thanks to safety sensors. This Ultra model comes with another feature: the Health Counter. It keeps track of how many times your cat, or cats, use the box. Issues with bodily functions can be early indicators of a problem, so this feature provides peace of mind. You will love having it do the work for you. Litter can get seriously expensive when you are switching it out every single week. Want to save some money and keep the house smelling fresh? Try the Pet Zone Smart Scoop Automatic Litter Box. It is both affordable and practical, a must-see for any cat owner. Here’s how it works: The sunny green and white box can be loaded with any clumping cat litter. No expensive special litters are required. Metal gears and a strong motor unit move the filter through 15 minutes after a cat leaves the box. The no-touch waste bags are easy to remove and place in the trash. You can use your favorite flushable litter, and get rid of waste that way. In the meantime, an odor-absorbing carbon filter keeps you from smelling anything nasty. The box is easy to take apart and clean. It’s extremely quiet, and won’t scare your felines as they use the potty. A one-year warranty comes with your purchase, too! 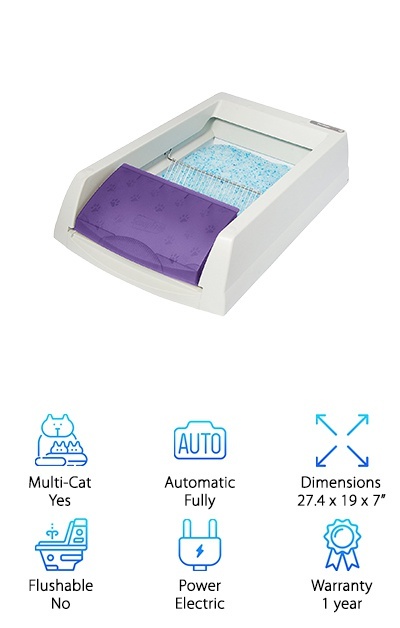 With a little jump, your kitty can assert their independence and hop right into this beautiful automatic litter box. 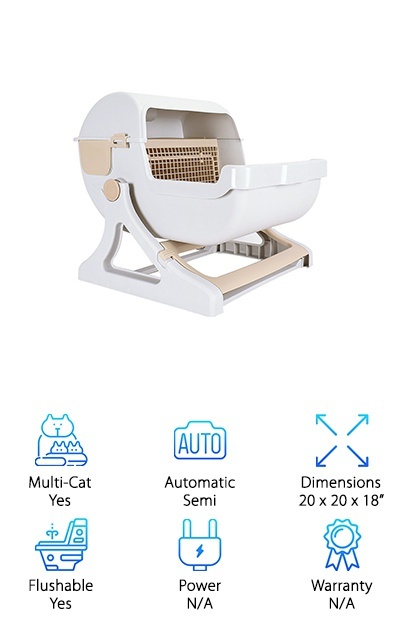 The Le You Pet Semi Automatic Luxury Cat Toilet is proof that even little Delilah or Murphy deserves a porcelain throne for doing their business. They go, and then you clean up by simply tilting the litter box backward. The filter keeps the clumps separate and they can be taken out and disposed of easily. Even better: You can still use your favorite kitty litter. If it is flushable, the waste can be dumped right into the toilet. Do you hate getting down on your knees and scooping out the waste with a tiny scooper, keeping the other hand over your nose and mouth? This is quicker, easier and more sanitary for everyone involved. The litter box is generously sized at 20 by 20 by 18 inches. Both adult cats and kittens can leap right in and get to work. Think of the PetSafe Simply Clean Litter Box as an assembly-line style product. It's easy to assemble, and then it is filled to the marked line with clay clumping litter. The cat goes in, does her thing, and gets out. Every hour, the PetSafe box will complete one full rotation of the litter placed in the central circle. The waste goes out, up the conveyor belt and into the waste drawer. Place any type of trash bag or recyclable bag in the bin to remove the clumps. It is remarkably simple. The device comes with a 6-foot cord, so you can place the box in any room, washroom or bathroom with an outlet. It comes with a one-year warranty, which is a wonderful addition to an economical purchase. Just the savings on litter alone can be significant. No special litter is needed, and no special bags, either. You and your cat will be pleased with this quiet solution. The keyword for the Littermaid Self-Cleaning Litter Box is "durable." Not only can it accommodate big cats, it can also work for multiple big cats, over 15 pounds. The box itself is extra-large, and it also has unusually high side walls to make room for several inches of litter. Your tubby feline will fit just fine. And there’s more: There is an automatic rake to move through the litter and get those nasty clumps out of the way. Every time a cat uses the box for more than 10 seconds, it triggers a built-in sensor. 10 minutes after the sensor is tripped, the rake moves through and cleans things up again. If a second or third cat jumps in, the 10-minute timer resets. There is also a safety bar to stop the rake in case of blockage. The waste receptacle will hold clumps and help hide odors until you are able to clean it out. It’s so easy!